Talk about a letdown of massive proportions. 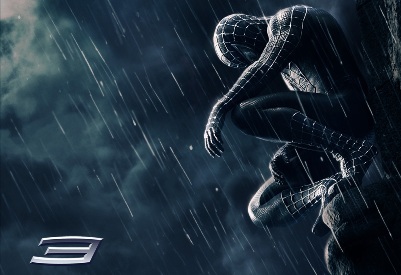 Yesterday I went to go see Spiderman 3 with fairly high expectations. I figured that they were justified seeing as this currently rumored to be the highest costing movie ever (around $500 million). Boy was I wrong. As the theater experience began, I had nothing to complain about; the previews were sweet! Pirate of the Caribbean 3, Shrek 3, and other great movies had me in a good mood. The beginning of the actual movie wasn’t bad either. A nice love scene and success for MJ opened very nicely. Then the depression hit. She was fired, Peter was being just stupid, and Harry was screwing everything up. It was around this time that the writing (screenplay) went to hell. Parker got “emo”, and my friends and I couldn’t suppress our laughter at the absurdity of what we were seeing. Died black hair? Eyeliner? On the world’s best superhero? I don’t think so. Everything just seemed so very clichÃ©; there was nothing new or unique to be seen. The whole idea of a villain coming back to life was overdone, and the “other worldly poison” moved too much like a high-tech Hexxus from Fern Gully (one of my favorite 90’s kids movies). The abundance of Spiderman-swinging-around-the-city scenes were overbearing. The fight scenes, while sometimes cool, were either too short, long, or unrealistic. I understand that saying that a movie is “unrealistic” is fairly ridiculous to say, but to have someone’s face ground against the side of a moving train and be unscathed is even more ridiculous. While one might argue that Sony was trying to stay true to it’s key demographic (young boys), why the PG-13 rating? While Spiderman 3 gave me a good laugh, lines like “wicked cool” made it impossible for me to take it seriously. My verdict? $500 million wasted.